Alba’s cell grown stock and a range of additional options – including controlled release fertiliser and protection against weevil damage – mean that we are the ideal choice when planting restock sites. Planting can be carried out throughout the year, provided there is sufficient moisture in the ground. Hand planting is speeded up as the planters do not have to contend with different sized root systems. The uniform nature of the root plugs also lend themselves to mechanical planting. Rapid early growth also enables the plant to get above the invading weeds – saving time and money on early crop care. This can be supplemented by the application of our specially developed fertiliser. 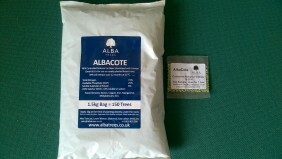 ALBACOTE is a controlled release tree fertiliser specifically developed and tested for UK forestry. It is a blend of NPK suitable for all types of trees and sites which will release slowly ensuring excellent establishment and growth and does not leach out under excessively waterlogged conditions. 10g is applied to each tree at planting and one 1.5kg bag will cover one full tray or bag of Alba stock. 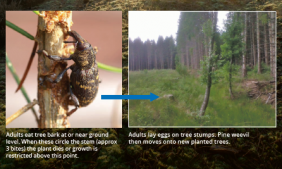 WEENETS have been developed by Alba as a step towards reducing the amount of chemical used in the forest and to protect newly planted trees against Large Pine Weevil (Hylobius abietis). The lightweight net is fitted to the tree at the nursery – each net is individually positioned around the root plug and lower part of the stem. Once planted out, the roots and side shoots can easily grow through the net and develop normally. Planters have found the netted trees even easier to plant than regular stock. When used in conjunction with a light chemical top-spray in areas of heavy weevil pressure, initial results have shown WEENETS to be very effective. Chemical Control Options for Hylobius – Alba is one of the only nurseries in the UK to have a mechanical spray race for the application of insecticide. We can offer a full plant spray or a reduced top-spray in conjunction with the use of WEENETS. Alba has recently partnered with ICL to provide MERIT to the forestry sector. MERIT FOREST is the only systemic pesticide for the control of Hylobius – it acts by both contact and systemic action. The active ingredient – Imidacloprid – disrupts the nervous system of insects, but not mammals. Treated trees will not affect non-target insects. 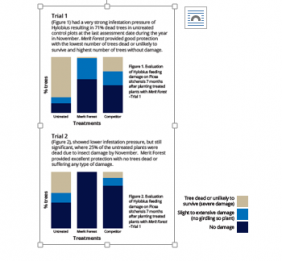 Considerable testing of the product has taken place, with impressive results. A pre-planting application helps to reduce the gnawing damage caused by Hylobius to conifers during the year of application and significantly reduces severe tree damage and death versus untreated plants or even Alpha Cypermethrin. MERIT FOREST is very gentle to the treated plant and does not damage new growth. It is also comfortable to use and handle when planting, with no allergic reaction to the user. © Alba Trees Plc 2019. All rights reserved.